Excellent livebinder on copyright for those working with global collaboration. The hungry caterpillar ebook (in a powerpoint) that uses sound effects and animations. You could use this on your board to retell the story. How to draw a fairy tale. This is an elementary level project that lets students draw the stories of the three little pigs and Cinderella. This is a downloadable worksheet. A wind power challenge for students for upper elementary, middle, and high school. This electric circuit builder program is something that you can use with all ages. It is a great resource for teaching about electricity. Some great lessons to use for science and Engineering week (in the UK but why not bring it over the pond) March 9-18th. If you are promoting STEM here are some fun lessons including the squashed tomato challenge. This blog post is an excellent tutorial about how the digital pen works. Hackers have knocked down Interpol's site this week in retaliation. Cybersecurity is a huge issue. "Tuesday afternoon, the international police organization Interpol announced the arrest of 25 alleged members of Anonymous by officials in Argentina, Chile, Colombia, and Spain. Shortly after the announcement, Interpol's website was hit by a distributed denial-of-service attack. At the time this story was posted, the website remained unavailable." Interpol announced that the arrests were made as part of "Operation Unmask", an international effort launched in mid-February to grab the perpetrators of attacks on websites in Columbia and Chile, including the Colombian Defense Ministry and presidential websites, a Chilean electricity company, and Chile's national library. Officials also seized 250 pieces of equipment, including computers and mobile phones, during a search of 40 locations in 15 cities. I'd like to help you get started just like I did with QR Codes, Web 2.0, wikis, etc. 1 - Get an invitation. Anyone can view Pinterest boards, but if you want to start pinning, you'll need to get an invitation. If you're on Facebook, this is simple. Just go to the Pinterest app on Facebook and look on the right (as shown in the graphic below) to see if you have any friends on Pinterest. If they've taken the time to like the Pinterest page, it is likely that they not only use it but like it. Message a friend or two and ask for an invitation if you don't like to be open about it. 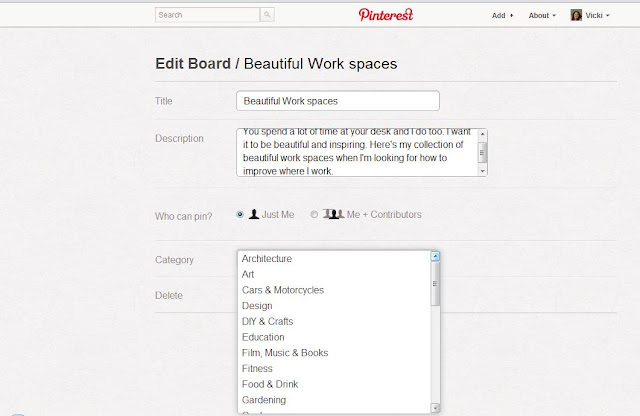 Go to https://www.facebook.com/pinterest?sk=wall and see which friends you know that "like" Pinterest. Ask them for an invitation. You can do like I did and ask on Twitter. I had at least 10 people who messaged me and said they'd give me an invitation. Don't be embarrassed, I've just been using pinterest for a week. Tons of people aren't there... yet. 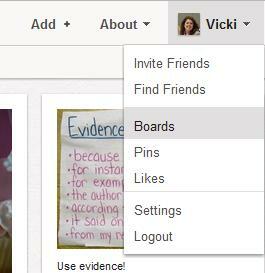 If Pinterest didn't ask you to set up boards, you can go to your name and click on Boards and it will take you to your boards screen. You'll want to have a few boards to start adding to before browsing and before connecting with friends. Usually pinterest suggests some for you. Note: What is particularly fascinating about Pinterest is that when you follow someone, you can follow either just the person or one or more of their boards. I usually follow the person and then can unfollow specific boards on topics that don't interest me (like Tattoos or wines), I can also just follow a random person's board about iPad apps and nothing else. It lets you get very granular with your time. Think of it as if you could segment a person's Tweets and follow just their technology tweets and leave off the junk about their dog. Happy Thoughts - 209 followers - "These are the thoughts of things that make me happy when I look at them. It is my personal mood booster." Things that make me laugh 221 followers - This is my board of funny things so I can always find them again. Like Mary Poppins' uncle, I love to laugh! Teaching ideas and apps 243 followers - Great ideas for teaching and helping students be more. Inspiration - 219 followers - I love to look at things that inspire me to be more. This is a personal boost for those days I need to climb mountains. Productivity 223 followers - I am a productivity fanatic. Here is where I'll post ideas about how to improve my life and get more out of it. With 3 kids, global collaborative projects where thousands of kids work together, books, a busy blog, and lots of social media to attend to, time is valuable. We all have the same 24 hours in a day but differ in how we use those hours. Let's use them well. Collaborative Writing 232 followers - My second book with @eyeoneducation is about collaborative writing. I co-manage wikis where over 1,000 kids collaborate AT ONCE. Google docs, and cloud tools are just some of the cloud tools I use to teach and encourage writing. I'll pin examples, ideas, and tools here to help with collaborative writing. Being a Social media Maven - 217 followers - I love social media and want to understand and use it well. Here is my collection of tools, ideas, and methods that help me in this area. Global Collaboration in Education (a board I'm inviting some friends to help me moderate) 222 followers - Excellence in global collaboration in education by people who are flattening classrooms. Beautiful Workspaces - 188 followers - You spend a lot of time at your desk and I do too. I want it to be beautiful and inspiring. Here's my collection of beautiful work spaces when I'm looking for how to improve where I work. Little BIG things to improve education - 194 followers - My collection of the little things that can improve education in big ways. Online and F2F Presentations 204 followers - A collection of my online and face to face presentations by Vicki Davis, full time teacher, @coolcatteacher, co founder of @flatclassroom. Board Description Tell people why you're making the board and what they can expect on the board. Who can pin? You can invite others but they must be on pinterest. I'm inviting our Flat Classroom teachers to our Global collaboration board to collect best practices, and it is taking a bit of time to get them invited, set up and then add as collaborators. Category. They have preset categories. This is important because a person can go to the homepage of Pinterest and browse by category. This category determines whether your pins might show up on the main pinterest feed or not. All of your boards should have a category. 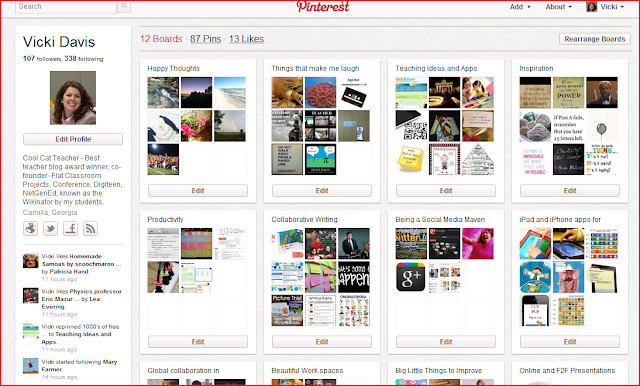 I'm so excited that Pinterest started off with an education category! That has helped teachers find each other. Once you've set up your boards, you can start pinning. 3- Pin some things on your boards. There are several ways to pin. Pinning Method #1: Pin from the homepage of Pinterest. You can always click the red Pinterest logo in the middle of the page to go back to the homepage. You'll want to click "everything" because you may not be following anyone yet. If you see interesting people, you can follow them, but I wouldn't link up with your friends quite yet. When you put your mouse arrow over a graphic, the options appear. I can repin it (onto one of my boards). I can Like it (it will now appear in my likes) and I can comment on the pin. WARNING: Your Twitter stream doesn't want to hear every pin from you. I made the mistake and tweeted out about 20 pins on my first day at pinterest. In the normal flow of life, I get about 18 unfollows a day. (inactive accounts or whatever reason) I got 66 unfollows on the day I started pinning. I've since limited my pin Tweets to just 2-3 important items a day. I do post my pins to Facebook on my timeline, just because I want to. We'll see how that works. I'm having you WAIT on this, because when you go and add all your friends from Facebook, you get one chance for them to decide you're interesting and that they want to follow you. I waited to do this until I had at least 5 boards with quite a few pins on them. I wanted enough pins so people new I was legit and not just another person starting and fading into the sunset. Then, I went and found my Facebook friends on Twitter by clicking on my name and finding my friends. Find your friends and then you can start pinning from your main stream. Finally, you can find other people to follow at the bottom. 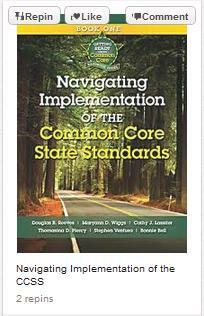 I can see another board about common core and others from teachers. I've found that when I go on a new site that if I find and follow 300 good sources of information in my field that I will begin to get meaning out of the content. Sometimes I have to go unfollow content. For example, there was a great pinner I found who also had a real tattoo fetish that filled up my whole screen. I unfollowed just that board and it cleaned up my stream right away. I did this on Twitter and every other site. After I follow 300, I start engaging, sharing and being as helpful as I can. If you're sharing in social media because you want to be the hot chic on the block, think again. People will see through your diva charade in a moment. Be real and be really helpful. If you are helpful, kind, and useful, people will follow you. If not, you'll still learn a lot. Have fun on Pinterest and be sure to share your tips below. An excellent paper from Educational Technology magazine about preparing K-12 teachers to teach online. This article by Greg Kearsley and Robert Blomeyer is an excellent overview and still current. This is fascinating. New conditions make for circumstances we cannot predict. Horseradish is a popular condiment in space because of the congestion astronauts experience. I find this interesting. "To make space food more interesting (and probably generate some buzz while they're at it), NASA invited Rachael Ray to create some spaceworthy recipes; the selections favored by astronauts included spicy Thai chicken and vegetable curry. Emeril Lagasse joined in too -- with green beans in hot sauce. A ship drops anchor in Mombasa, Kenya and hits a set of fiberoptic cables and six countries experience outages and slower Internet: Kenya, Rwanda, Burundi, Tanzania, Etiopia, part of south Sudan. Those in IT will want to read Gartner's predictions for IT as a way to understand what is and what will happen. Aseducators, we need to make sure we understand the cybercrime impact and work towards creating an educated citizenry capable of protecting themselves. By 2015, mobile application development (AD) projects targeting smartphones and tablets will outnumber native PC projects by a ratio of 4:1. By 2015, 35% of enterprise IT expenditures for most organizations will be managed outside the IT department's budget. By 2015, low-cost cloud services will cannibalize up to 15% of top outsourcing players' revenue. Those who love Apple will love this news. iPad 3 may already be shipping. I don't know which is more interesting - Apple rumors or the lengths that Apple fans go to verify rumors. In many ways, their secrecy has become a marketing tool for Apple. It is likely we will be asking for Google Glasses for Christmas. These will be android based glasses that we will wear that include 3G and 4G data connection including sensors and GPS detectors. Prepare for a new form factor -- motion and the human eye, we may not be using tablets at all. A wiki about reflective practice that includes a selection of tools for reflection. (by Helen Barrett and others) This is a very nice wiki built using Google sites with a lot of good information. Pinterest is a very cool site but it is obvious to a even a casual user that there are copyright issues. The site hinges around the use of graphics and the clean interface that lets you use the picture and add text may be what gets them in trouble. You have to click on the pic to see the copyright holder. Here is an overview at Read Write Web of the problems Pinterest is going to have legally and it could shape the future of the rapidly growing site. This happened just after Flickr added code to prevent pinterest from pinning Flickr pics. I think Flickr may find that it hurts them. People read more on Mondays and share more on Thursdays. This will help you decide when to share your work, although it is great to share when others don't. Sometimes my most shared posts happen when others are asleep. Schools don't teach classes to kids who wear glasses? Many of us have been telling you for some time that banning cell phones is going to go the way of the dodo. By Christmas, Google will likely be selling some Oakley-looking glasses that will display search results and run on the Android operating system. It will be a matter of time before these are prescription style glasses and people like me can wear them every day. It is increasingly apparent that we have go tot go exist with smart devices and focus on what we're doing instead of banning the devices altogether. Are you going to start discussing the USE of devices now so that you don't look like a person who just didn't see it coming by the end of this year? Start thinking about educational uses, technology is here to stay and we're rapidly approaching the day of implanted devices, first to help those with disabilities but later to help all of us have abilities we haven't dreamed up yet. Distractions abound, we have to all learn to focus and do the appropriate task for that moment. There are no easy answers for this and banning cell phones and handheld devices just isn't the way to keep kids on task in the long run. How to reengage students with learning. There are 8 things that I think we can do now, as teachers, in order to bring our students back and reengage them with learning. Watching the republican debate this past week, I believe that the tide has turned against NCLB from both Republicans and democrats. I hope that we don't swing the entire other direction and have no accountability. We need accountability just not all due to standardized tests. We need flexibility and local control, however, some oversight. These sorts of things require balance. Unfortunately, in the US, when the pendulum swings we tend to go to extremes when most often wisdom lies in the middle where the level heads meet. "It behooves us to take a careful look at the policies at the heart of NCLB, because they have not worked, [and] if they are not working, we need to change them," said Monty Neill, chair of the Forum on Educational Accountability (FEA), at the FEA House Briefing on Assessment last Thursday. Great article on US news about initiatives in the US that have started but of special interest is the request that students and educators tweet. The biggest issues I've had with the town hall meetings is that most of them are in the middle of the day when everyone is teaching. On Thursday at 3 pm there is a chat about rural education. It is nice that they're having these meetings but if they REALLY want teachers to participate it will be when teachers are able to focus on the conversation. You can't have teachers teaching and Tweeting. It doesn't work. If you see me tweet during the day, most of the tweets are scheduled or I'm on break or lunch break. "February has been a busy month for K-12 education. On February 1, U.S. Secretary of Education Arne Duncan kicked it off by announcing that all U.S. schools should transition to digital textbooks within the next five years. On the 9th, President Obama waived 10 states from No Child Left Behind. And last week, the president proposed a 2013 budget that includes a $1.7 funding increase for education." Although these federal policy decisions may not seem directly connected to day-to-day classroom activities, the Department of Education is using Twitter to encourage teachers, administrators, parents, and students to play a more active role. Here's the page that high school literature teachers will want to go to. On the left hand side you'll see "Sub Sub topic" and you can click on the play. Click More and you can see even more plays. This way you can find information by play. One of the things I found is a popular resource that uses Simpsons Images linking to Macbeth. (Not sure about copyright but it is there and is very popular.) Curriculum directors will want to share this with their English departments. This is a powerpoint listing the major events in Macbeth, each slide describes the event (eg Macbeth kills King Duncan) and has a corresponding image using Simpsons characters. This is a fascinating holistic through through Shakespeare by English teacher, John Field. Including Much Ado about Nothing and Romeo and Juliet. He calls these his "tudor hall shakespeare units." If you teach Shakespeare, you may want to look at this and the other items here. Here's a tip: If you look at the classification at the bottom KS3 means high school and then you can click on Plays by Title and click on just about any play you will teach to find a lot of lesson plans and information for that play. If you're a beginning teacher or looking for new things, you'll want to drill down. I hope you'll share too. This teaching pack includes a pdf and word document and will let you read about love through the ages. Drama, Poetry, Prose are covered in this high school resource for English literature. Great topical reading for February. I recommend this for literature teachers. How much do your students know about Europe? Here is a set of activities including maps, flags, and a few quizzes relating to this content. For those who want to make sure that students are globally literate (including geography) this is one of those resources you may want to add to your folder. This software is supposed to make it easy to airprint all of your printers so you can print from iPad or iPod ir iPhone. It uses Bonjour and comes highly recommended. My sister is a graphic designer and says all of her friends are raving about it right now. Worth a try as her friends are super picky. Blurb Mobile is a site that some are using to create stories. Here's a teacher's zoo trip. You could use blurb mobile to make stories for field trips. This wiki is about the gamification of websites including those in education. The entire wiki is dedicated to this technique. This was also one of the trends in the 2012 HOrizon Report. This article is one people still point to when discussing personalizing learning for students. It is a great op-ed in the Atlantic. Software customizes the learning process so that students learn in ways that help them and progress at their own pace. New Google presentations editor announced. One reason to join the HASTAC site is the listing of papers, grants, and other fellowships on the site. The list seems to be very current. You can also post opportunities when you join. I've joined the HASTAC website and am impressed with how they have people connecting and sharing. You can earn badges, blog, share and join groups. It has a very polished look. Unfortunately, you can't link to Twitter and your other social media accounts, but that is OK. Still learning and hope that others will show me how this works. This is a winner in the digital media badges for lifelong learning competition. "In the Youth APPLab, middle and high school students in the District of Columbia design software and mobile apps in an after-school program that supplements their formal learning in computer science. They conceive, develop and co-create their own Android Apps. Ultimately, students and their apps will compete for internships with technology-based startup companies in and around the DC area." This is an example of how tagging is so helpful. If you're following the open badge movement, you can look at the HASTAC badges tag on their website and stay up to date. For netgened students, badges relate to game based learning as they are part of gamifying learning: a trend that will continue to influence education. "Learning Communities: Groups of teachers who are committed to continuous improvement, shared responsibility, and collective goal alignment. Leadership: Skillful leaders who develop capacity, advocate, and create support systems for professional learning. Resources: Prioritizing, monitoring, and coordinating resources for professional learning. Data: Using a variety of sources and types of student, educator, and school system data to plan, assess, and evaluate professional learning. Learning Designs: Integrating theories, research, and models of human learning to achieve intended outcomes. Implementation: Applying research and sustained support for implementation of professional learning to foster long-term change. Outcomes: Aligning outcomes with educator performance and student curriculum standards." American Association of School Administrators has redefined their standards for professional development. This article at eschoolnews gives an overview of those changes. Mark Wagner has created a very useful guide for educators about personal learning networks. This is an excellent read for those who want to use social media to build a PLN. A show about Grammar. This is the first episode. Some grammar teachers could incorporate this show "about the mysteries of English" into their classes. In the first episode of Slate’s new language program Lexicon Valley, producer Mike Vuolo and On the Media co-host Bob Garfield explore the history of the terminal preposition rule, and whether there are good reasons to follow it.